Spaniels, earlier referred to as “Spanyells,” have been around for centuries. This is a large and diverse group of dogs, dating back to the 14th century or perhaps even earlier. Spaniels of all types historically have been bred to hunt, either on land or on water, or sometimes on both. The American Cocker Spaniel is the smallest of the recognized Spaniel breeds and also is the smallest member of the American Kennel Club’s Sporting Group. In the early to mid-1900s, the American Cockers began to diverge from their English counterparts. 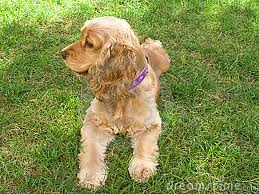 Outgoing, sociable and almost uniformly happy, the American Cocker Spaniel is an extremely popular family pet. They don't tend to make good watchdogs as they love people so much and thrive on human companionship. Being a smaller breed they are easy to take with you when going out or on holiday. They do need regular exercise, especially when younger, and will love accompanying their family on walks, swimming and any other activities you enjoy. Some of this breed do seem to have initial problems with toilet training, so the use of the crate at night time is recommended. They also have a tendancy to resource guard, especially food, so early training in this area is recommended. Due to their original purpose, these dogs will excel at flushing and retrieving and they also do well in dog sports such as agility, flyball, obedience, hunting and field trials. Due to their natual inclination to flush and retrieve, they should never be left off lead unless the area is safely fenced. If left alone and bored, they are known to become barkers, so make sure they are exercised before going out and leave them with chew toys such as the Zoink, stuffed with food or treats to keep them busy. The enormous popularity of the American Cocker Spaniel had its benefits for the breed but also brought some unwelcome consequences. Commercial puppy mills and other unscrupulous “breeders” began breeding Cockers indiscriminately, without attention to the health, temperament or well-being of the parents or their puppies. Fortunately, responsible fanciers of the American Cocker Spaniel intervened and continued promoting high-quality examples of their beloved breed. Today’s American Cockers by and large are the endearing, energetic, affectionate companions that made them among the most popular of all purebred dogs. Always purchase from a reputable, registered KUSA breeder, of KUSA affiliated breed club. Do they get on with kids and other animals? This breed loves children and usually gets along quite well with other dogs and even cats, provided that proper socialization takes place from when it is a puppy. This breeds coat is abundant and requires regular attention. Eyes need to be cleaned often and the beautiful long ears have a tendency to drag on the ground, requiring regular cleaning, both outside and inside to prevent debris from accumulating and infections from occurring. They tend to develop matting if coat not brushed on a regular basis and these can be very difficult to get out. As with all breeds early and continued socialization is necessary. They are very sensitive dogs and do best with a training method that incorporates positive reinforcement methods, with a lot of repetition and short training sessions throughout the day, bringing use of same into your daily interaction with the dog. As they can take off after a wonderful scent, it is best to teach the Real Reliable Recall when a puppy and to practice throughout their lives. Some of its serious health problems include progressive retinal atrophy (PRA), cataracts, patellar luxation, and glaucoma. Diseases like elbow dysplasia, gastric torsion, and epilepsy can occasionally affect the breed. Other minor health problems that the American Cocker Spaniel suffers from include cardiomyopathy, ectropion, urinary stones, otitis externa, canine hip dysplasia (CHD), hypothyroidism, seborrhea, phosphofructokinase deficiency, entropion, "cherry eye," liver disease, allergies, and congestive heart failure. In order to identify these conditions early, a veterinarian may recommend hip, knee, thyroid, or eye exams during routine checkups; DNA tests may be used to diagnose a phosphofructokinase deficiency, which may lead to anemia in the dog. Woodcock. Cockers were originally bred to hunt woodcock, though most today are family pets. The coat of the breed come in a variety of shades with the colours being separated into three main groups: black/black and tan, any solid colour other than black (ASCOB), and parti-colour.